Sitecore.Net , Veni ! Vidi ! Vici ! after all it is, all about JUST an ITEM ! I've sitecore 8.2.1 and content delivery web app is integrated with form based authentication. I enabled third party google login using OAuth2.0 open id without using .net OWIN or Sitecore OWIN setup. I just keep the whole flow simple with very minimal impact to the overall architecture. Made solution easy to decouple in future or reuse it across the different project. Handle log-off so that user is redirected to specific login page. Handle CSRF Cross side anitorgery token using State property of api call. Create a separate login screen or existing screen for that matter. Assume there is a button say google login in it. On click of it , it will initiate google login screen and consent form etc.Google returns Authorization code. When user select his/her google account and give consent user is redirected to respective home or landing page. In this part access token is received based on Authorization code. Custom authorization can be checked against custom application database and accordingly user will be redirect to landing page. Mind it. The first redirection url is registered with google that is where we will write our login in controller action. In order to work through different login mechanism the only way to handle session and log-off is to set a application level state flag. please note above code is just for reference and it is draft version. You can refine and refactor as per your needs. this combination notation is useful if you want to clone an existing collection and then make some tweaks to it. We want to process numbers and categorized them into categories. This could be any data and we want to classify them based on requirement. Just to create small proof of concepts here is the sequence of numbers and idea is to classify them into even, odds and so on. Linq Aggregate with Union to show them all. It is one of the amazing tool or add ins for OneNote users. This is very helpful for students and content author to proof reads or improve their language skills. Install this plug-ins free of charge if you are OneNote user. An alert service has become more powerful day by day due to advent of Azure AppInsight. Microsoft is actually listening to developer and support/operation aka (devops) team very closely. Now we can get alert at very granular level. Whenever you performance test or UAT testing it is good to enable sitecore logs trigger straight into your mail box or into slack or any web hooks. It is easy done. I keep this demonstration simple . I injected simple trace sitecore logs query which will be triggered every 10 mins if error count greater than 1. Open your Applnsight blade, look for Alert and add new alert . Below screenshot is self explanatory. Cool part about it you can add any level of AppInsight Analytics query in it. It is very flexible. This is always the case when we write some custom filter without being understanding the sequence which we should be using. One classic example is to handle custom Unauthorized Access for application permissions at Controller Action level. Say if it user has authorization of application but some of the permission is not allowed and still it executes controller-action then it is a serious issue. ValidateApplicationPermission results into 403 access denied leak. It captures access denied and tries to redirect however it is redirecting with executing existing action filter which it should not suppose to be. Use filterContext with its Result, obey filters and its context. 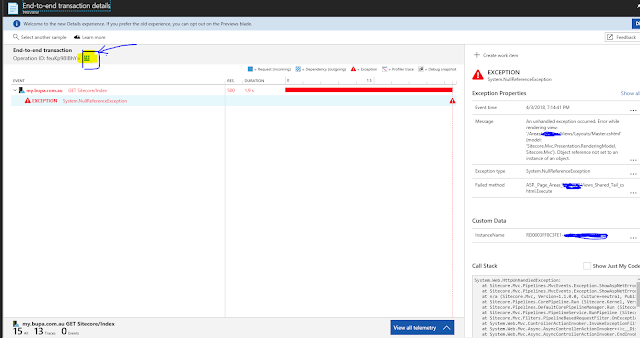 The Microsoft Azure AppInsight has made so much easy for us to trace the request execution sequence for any exception traces. You can actually see how the request has been executed for given exception. This way it is very easy to troubleshoot and fine actual root cause of the problem. 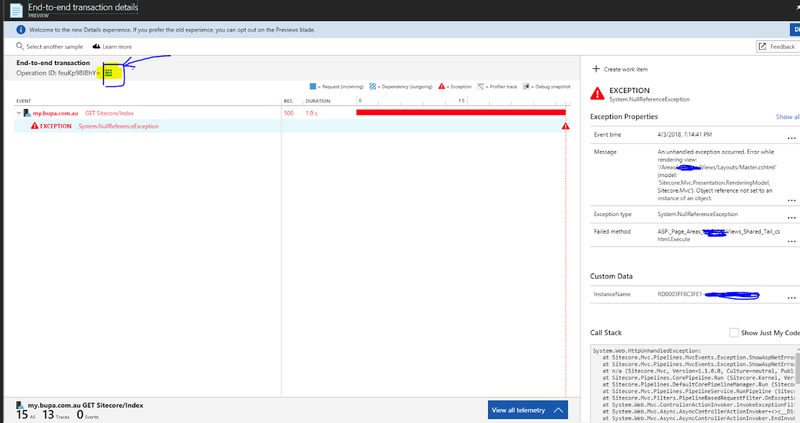 Open up AppInsight Anaytics query analyzer to view the sequence trace leading to an exception. Suggested- Click on one of the exception to view Operation ID and from this operation id you get all trails and missing piece of an issue.